It’s true, Australia IS being invaded. 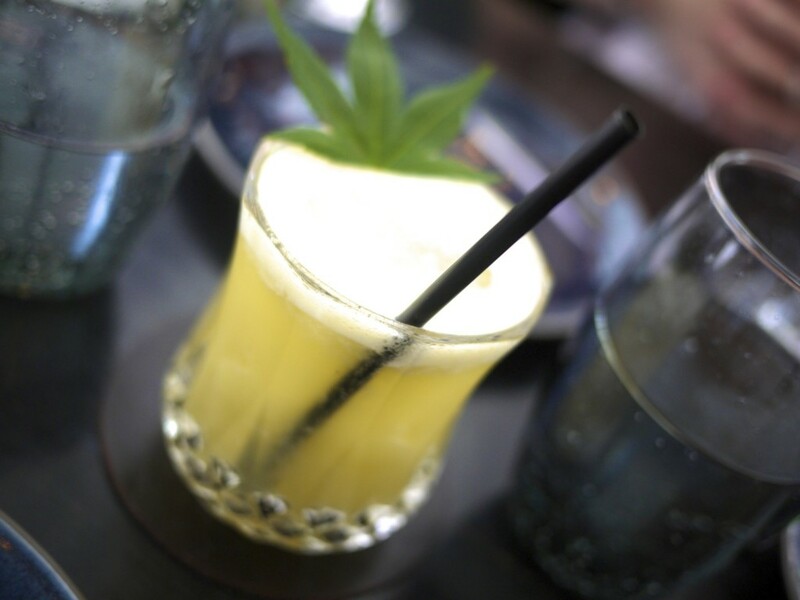 The Kiwi’s are taking over…. Well at least in the food world where they are certainly making a scene in the fine dining scene across the big Australian cities. My first encounter was that of Ben Shewry, who I still think is my favourite chef currently in Australia. 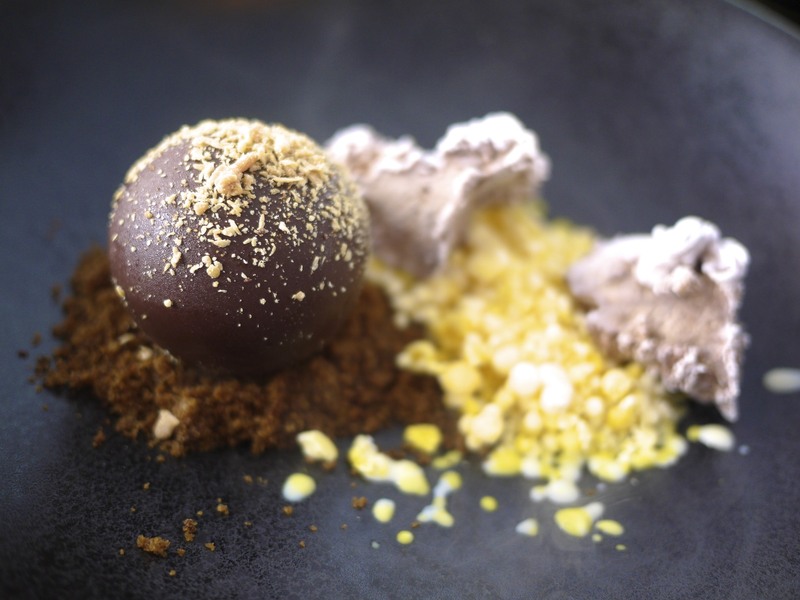 However, I recently found out that there has similarly been another Kiwi chef making a name for himself in Sydney but in the discipline of molecular cuisine. His name is Grant King and his restaurant is Gastro Park. King worked his way through Europe under big names such as Gary Rhodes, Bruno Loubet and Gordon Ramsey. More recently he cemented his place in Sydney’s fine dining scene at Pier under the supervision of his mentor Greg Doyle. 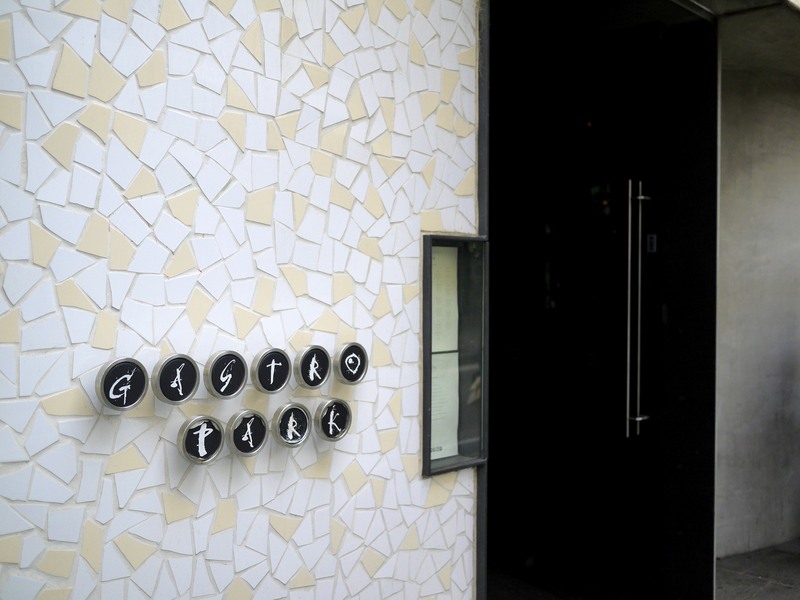 He finally went solo in 2011 opening Gastro Park where he rapidly achieved two hats within four months. 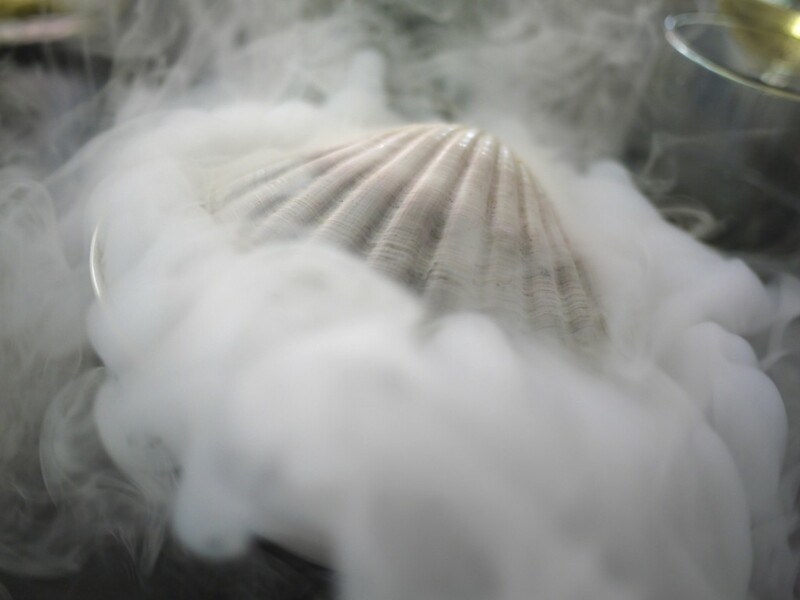 He is renown for combining molecular techniques and creative ideas with fresh seasonal ingredients. 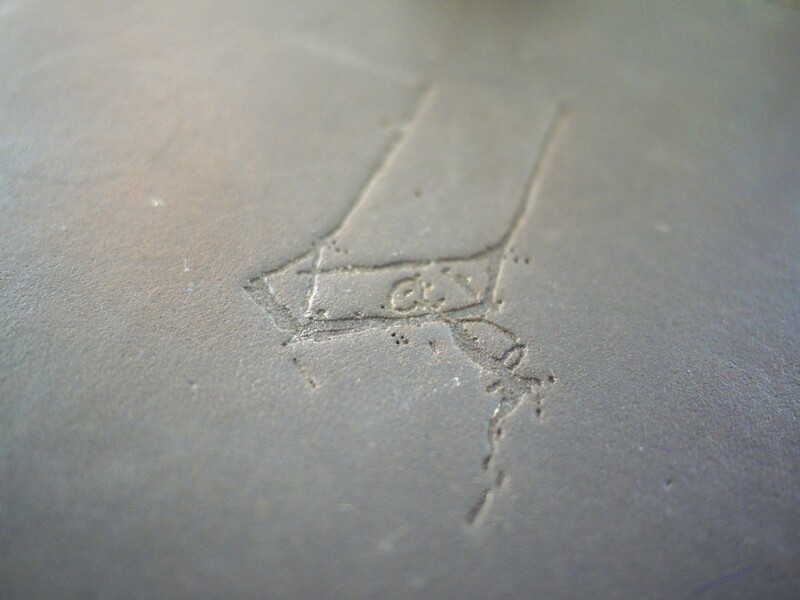 This ensures his menu continues to evolve every day, keeping him challenged; not something any ordinary chef would take. The perfect opportunity came up for a visit when my family and I were catching up with friends from the UK Guild of Food Writers who were in Sydney for holidays. One of the lovely things about Gastro Park is that they accept BYO. As it was a special occasion I had popped a bottle of my 2006 Greenock Creek Roenfeldt Road Shiraz in my luggage and, for a mere $30 corkage fee, the sommelier took the bottle to decanter as we took our seat and ordered the 10 course Tasting menu. It was going to be a great afternoon. 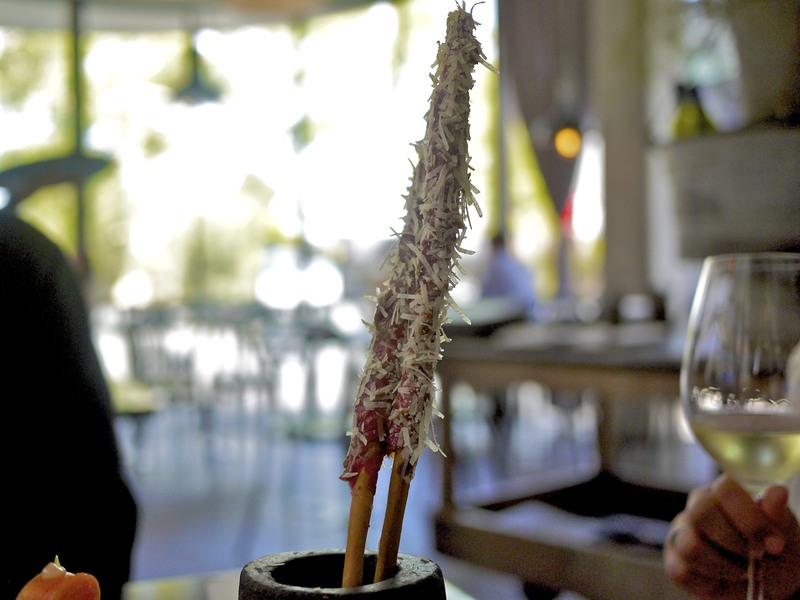 Course 1 – Grissini wrapped with wagyu and parmesan: The first course was technically made up of a few snacks. 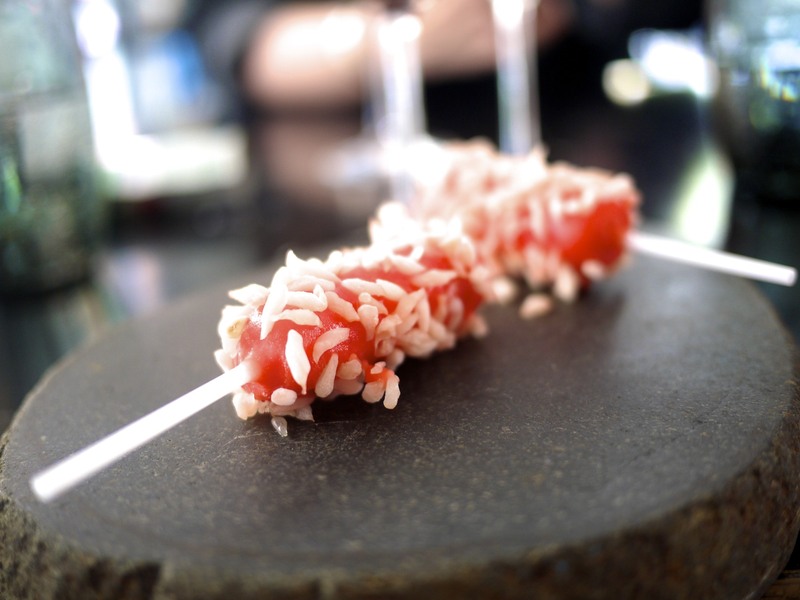 The first was a generous portion of thin raw wagyu slice that completely covered the grissini stick. The saltiness of the parmesan drew out the flavour of the meat. Simple but clever and tasty. 2nd Course – Earth tartlets with buffalo mozzarella: This was very light and slightly cheesy in flavour. The wafer thin shell of the tartlet was a good textural element. 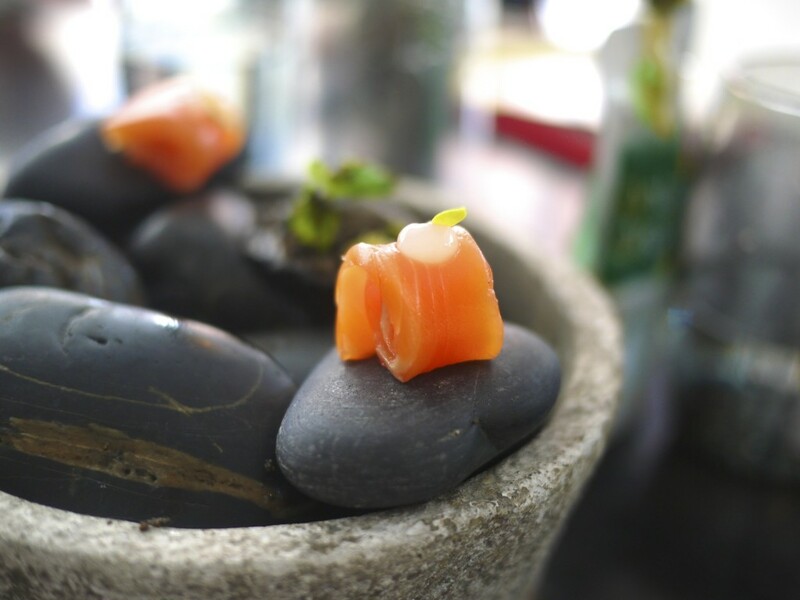 3rd Course – Salmon with yuzu: The last installment of the snacks was a beautiful slither of salmon with a dab of a light yuzu sauce that cut through the oiliness of the fish. 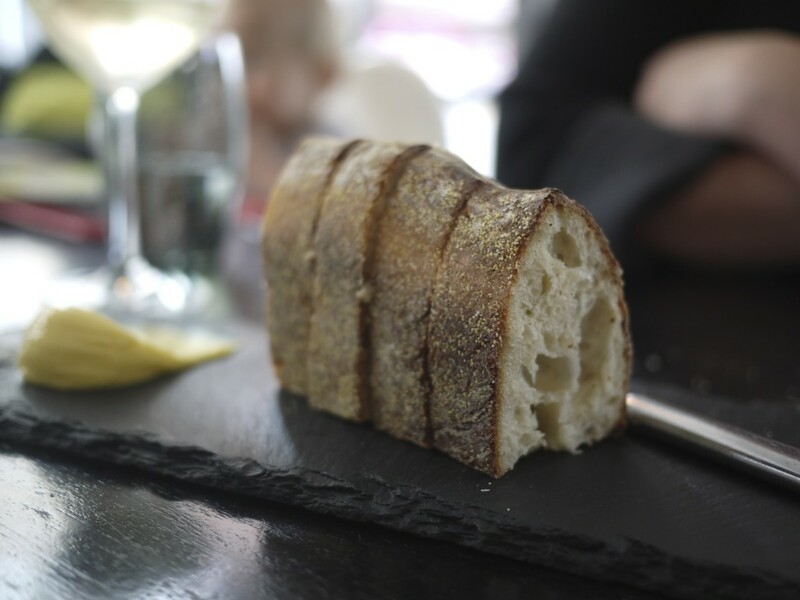 Some home made bread with butter prior to the first main course being served. The bread had a good texture. 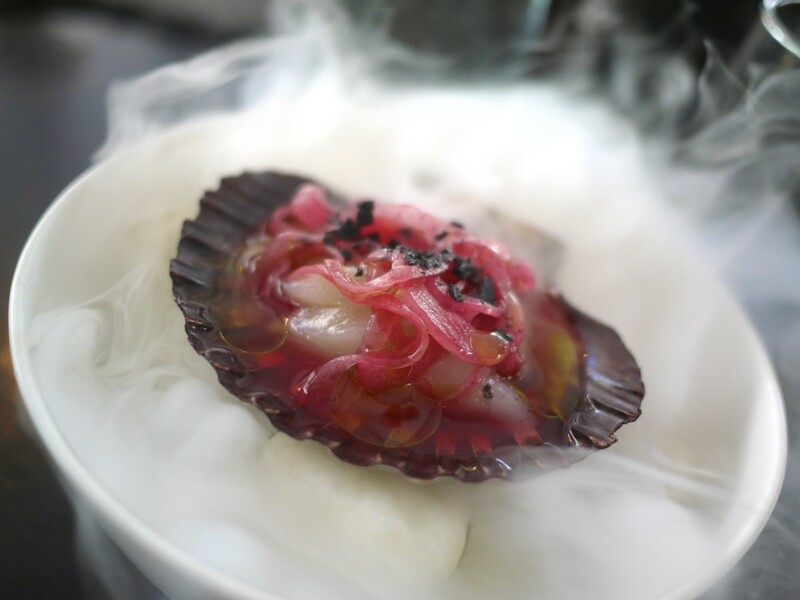 4th Course – Scallop & Pomegranate ceviche: A generous portion of king scallop morsels were scattered underneath slices of marinated soft onion. It was dressed with a slightly tart pomegranate juice which was well balanced against the sweet scallops. 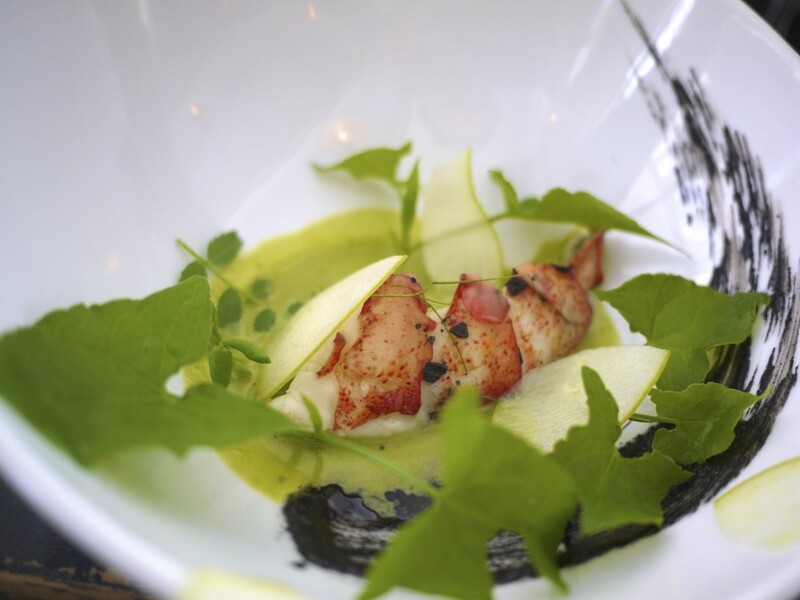 5th Course – Seared lobster, coconut, apple, sorrel and kaffir: Seared lobster tail cooked perfectly with a light smokey flavour. It was a beautiful light summer dish and the flavour combination was not too dissimilar to Thai flavours. 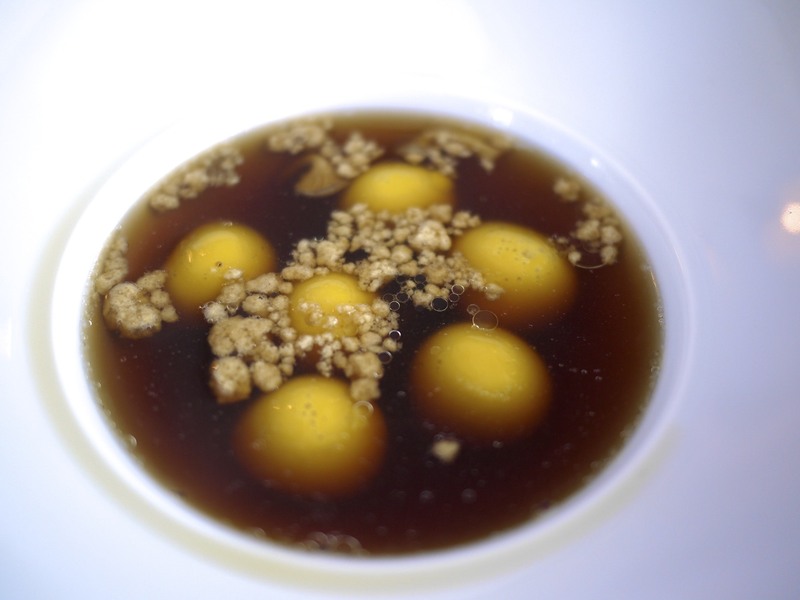 6th Course – Liquid butternut gnocchi, mushroom consommé: This dish has featured on the menu for a long time due to its popularity. The butternut gnocchi spheres were sweet and burst in your mouth with little effort like an egg yolk. The mushroom consommé had a lovely deep flavour and the onion crumb elevated the dish, creating a perfect balance of sweetness and earthiness. Based on the press, I expected this dish to be more gimmicky but I was absolutely wrong. 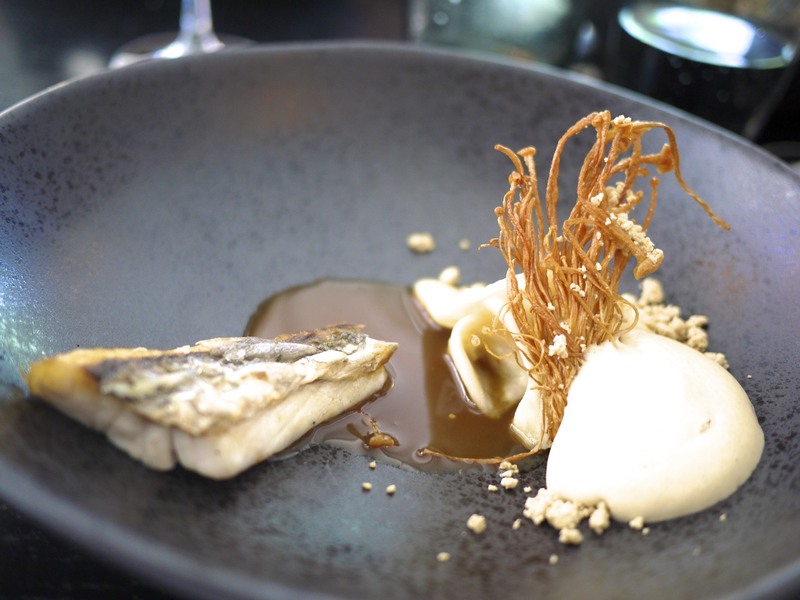 7th Course – Crispy scaled wild jewfish, salt baked celeriac, roast bone sauce: The edible fish scales idea was inspired by Spanish chef Martin Berasategui. The scales were pushed backwards so they stood up before being doused in smoking olive oil until they fried into edible crisps which crackled and popped. The richness of the roast bone sauce and the crispy fried enoki mushroom worked ever so well with the fish. A truly delicious dish. Impressive. 8th Course – Roast pork belly, spanner crab, carrot, pork pebbles: Another winner of a dish with the cracking ‘pork’ pebble crackling. 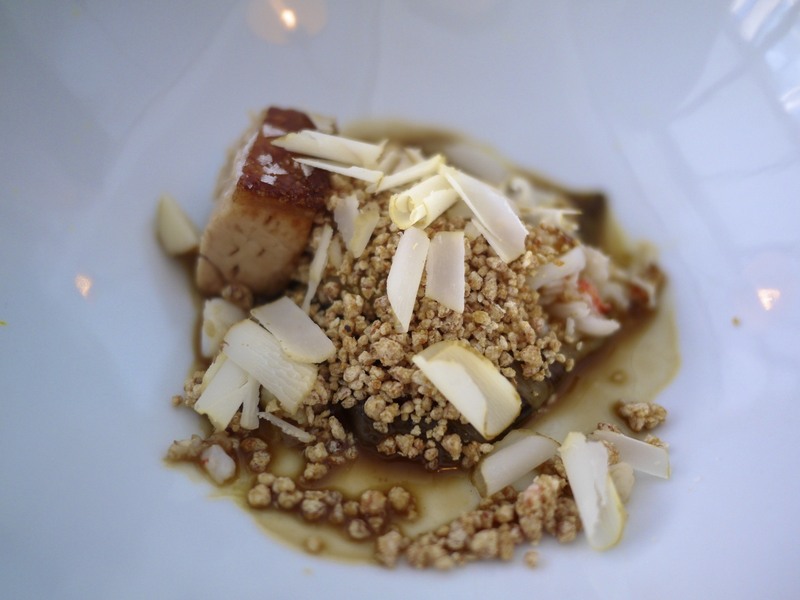 Who would have thought that the creamy spanner crab would work so well with pork belly? This dish was all about the texture and flavours and by god it went down so well with our bottle of 2006 Greenock Creek Roenfeldt Road Shiraz. 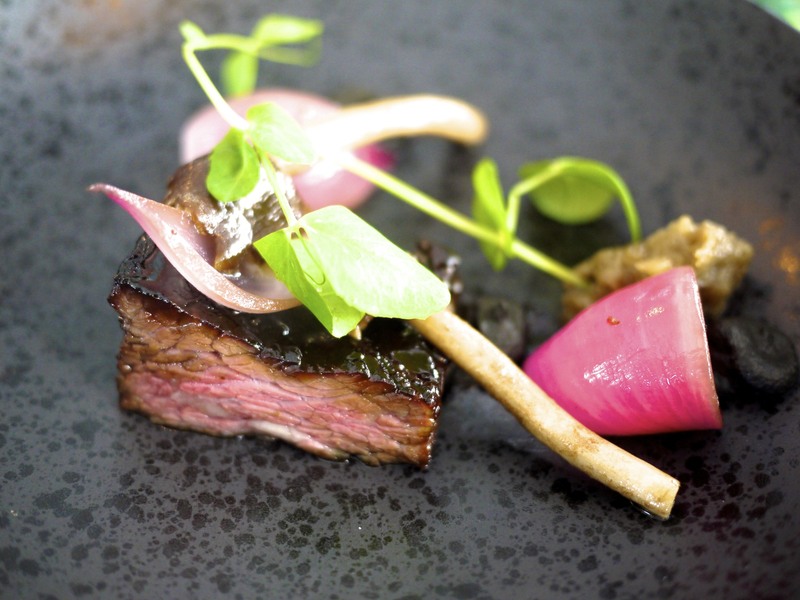 9th Course – 48 Hours slow cooked Riverina short rib, smoked eggplant, pea & pods: Beautifully pink inside from the sous-vide preparation and yet with a delicious sticky glaze on the exterior with the robata grill finish. The garnishes were simple but complimented the beef, the star of the show. The smokey eggplant was my favourite garnish. 10th Course – Sheeps milk yoghurt, strawberry and pint grapefruit icy pop: Perfect palate cleanser that was equally beautiful and playful. However, I wasn’t sure whether this should have been called a course as it disappeared in two quick bites. 11th Course – Robata Pineapple, yuzu ice cream, buttermilk, fennel: Why did I even bother worrying? This was a stunning dessert. 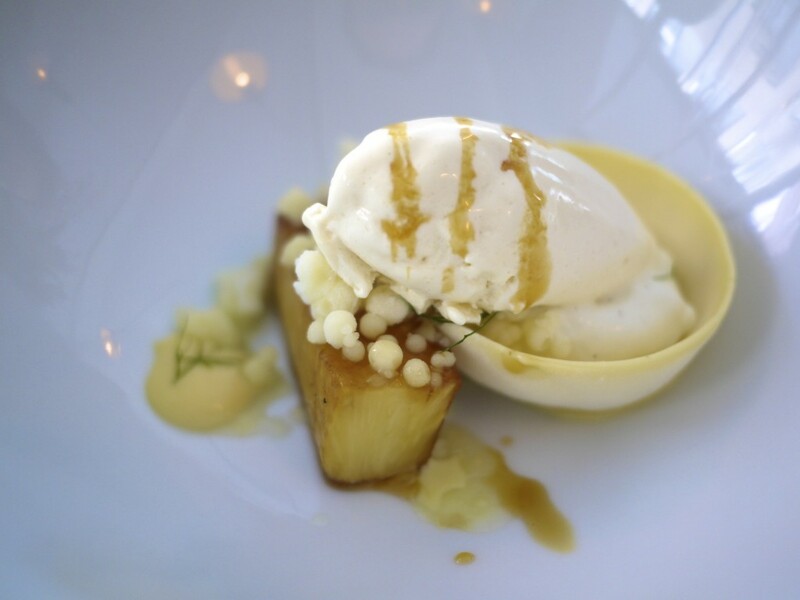 The sweet caramelised pineapple and the tart yuzu ice cream was a marriage made in heaven. I even found that liquorice / aniseed flavour, created by the use of fennel, rather enjoyable. 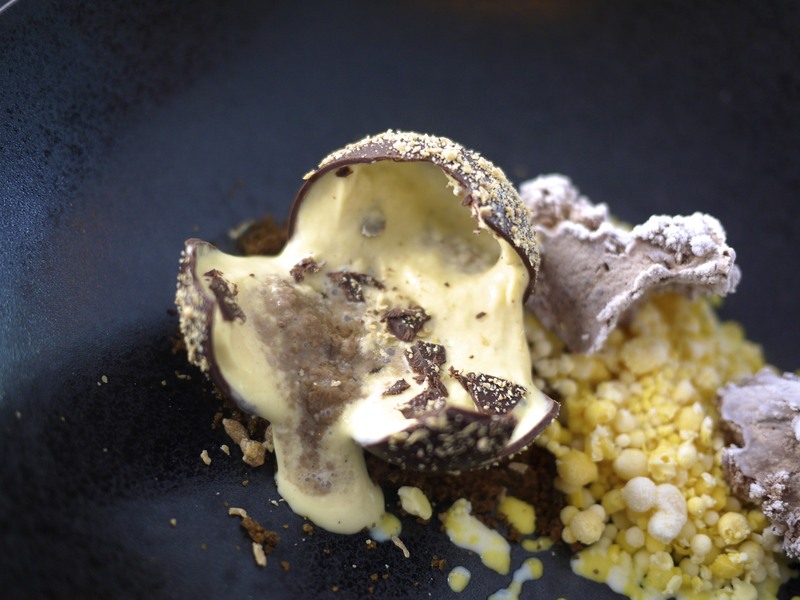 12th Course – Chocolate, honeycomb & vanilla sphere, cardamom, saffron, ginger: The finale quite literally went with a bang… … after cracking the chocolate sphere. A lovely chocolate mousse, vanilla and honeycomb (which had been delicately spiced with a mixture of an cardamom, saffron and ginger) oozed out of the sphere. The spices lifted this dish from becoming a heavy and mundane dish. It divided us down the middle. Two dinners loved it and the other two were not too sure. I for one thought it was clever and delicious, although not as good as the previous dessert dish. Gastro Park was far more than just cutting edge molecular cuisine. Chef King clearly had a great palate, creativeness and a sense of playfulness that made his food rather unique in Sydney. I expected some dishes to have more style over substance but I was wrong. 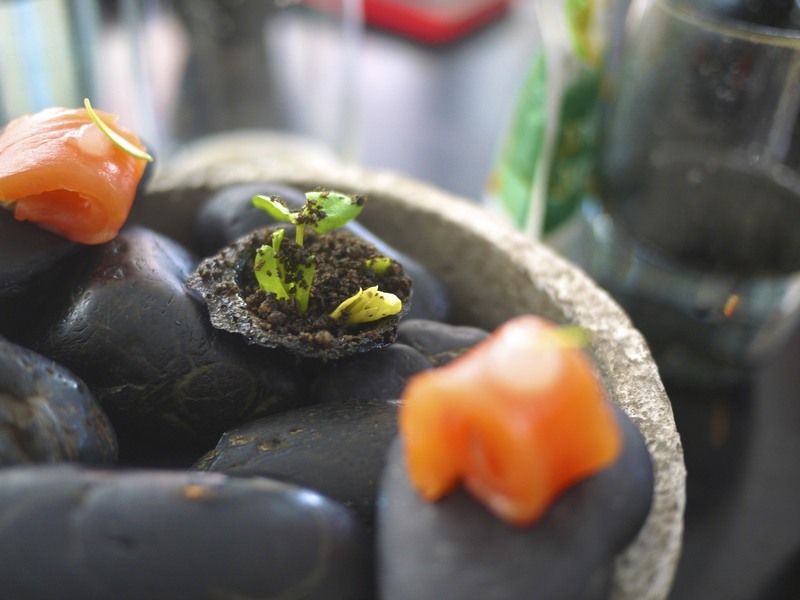 For all the wizardry and playfulness, Chef King never lost sight of what was most important – good tasting food. To top it off, the service was also very good, particularly given that our party included two 1 year old babies who occasionally felt like reminding us that they were there. We were very grateful for the care and attention of the staff. We left the restaurant with a smile (and our daughter asleep in her stroller), only to realise then that we had been dining for four hours. 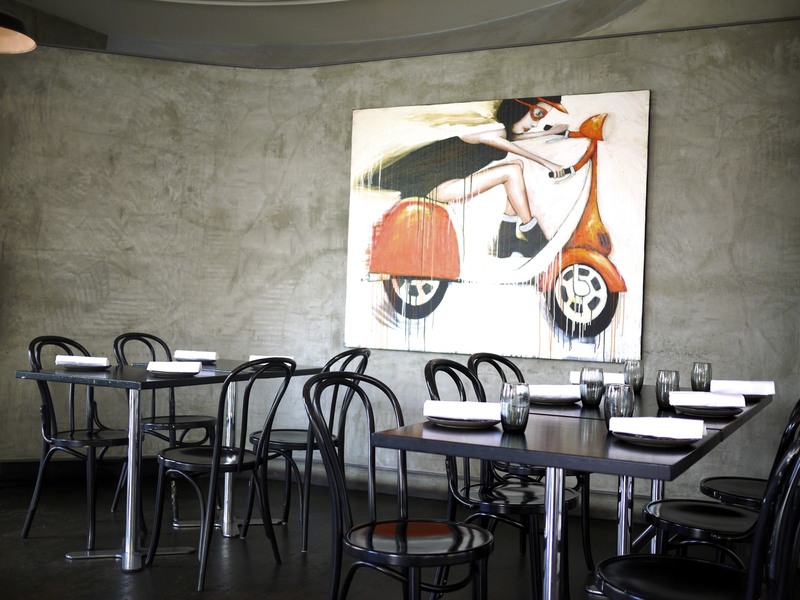 This entry was posted in Australia and tagged Australia, Gastro Park, gnocchi, Grant King, Molecular cuisine, Potts Point, spherification, Sydney on January 8, 2016 by admin.